Mohamed Nureldin Abdallah/ Reuters Sudan's President Omar al -Bashir waves to his supporters during a rally at the Green Squire in Khartoum Jan.9. Mr Bashir's regime has been rocked by weeks of protests. As a massive antigovernment protest movement mushroomed in Sudan over the last three weeks, from a distance it appeared obvious which side Western powers were on. 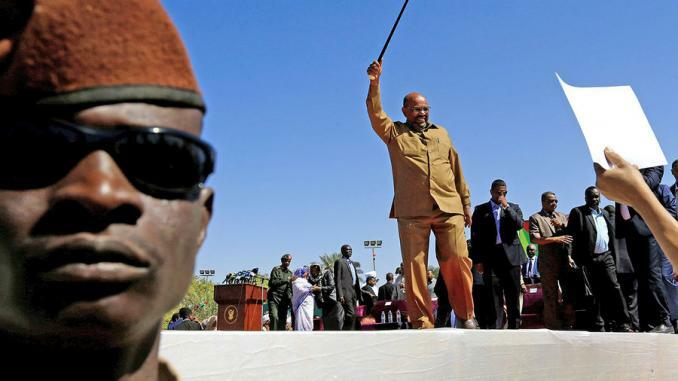 Sudan’s beleaguered President Omar al-Bashir, meanwhile, made clear that he felt foreign powers had helped stoke the unrest – which started over economic concerns – through sanctions and other measures. “They besieged us economically to make Sudan kneel down,” he angrily told a rally of supporters last week. But behind both these statements sits a complicated reality. Mr. Bashir is wanted for war crimes in the Darfur region and has, in the past, provided safe haven for known jihadists. But if his nearly 30-year regime topples – as those marching against him hope – the US and Europe will also lose a government that has enthusiastically supported their counterterrorism efforts in the region and helped them staunch the flow of irregular migrants into Europe. That puts Western governments in a deeply contradictory position: unable to openly support Bashir’s deeply oppressive regime, but largely uninterested in calling for its dismissal, either. “Western governments have, for a long time, had this very paradoxical relationship with Sudan, where it is simultaneously a pariah and a de facto ally,” says Willow Berridge, a lecturer in history at Newcastle University in England who studies Sudanese politics. And that means that how Western countries respond may depend in part on how much pressure their citizens put on them. The knotty relationship between Sudan and its Western allies is, in many ways, not unique. From Ethiopia to Chad to Niger to Rwanda, Western governments have often prioritized stability over democracy on the African continent, particularly if the country in question is seen as strategically important. And Sudan, which sits in a kind of buffer zone between Africa and both Europe and the Middle East, is especially valuable. But Sudan’s relationship with the West is also a particularly fraught one. This is the country, after all, that once harbored Osama bin Laden, and more recently put down a rebellion in the western region of Darfur with a campaign widely described as genocide. For two decades, the country was the subject of intensive US sanctions, and it remains on the State Department’s list of “state sponsors of terrorism.” When President Trump announced a travel ban for individuals coming from several Muslim-majority countries to the United States in early 2017, Sudan was on the list. At the same time, however, Sudan has become an important counterterrorism partner for the United States. There is a large CIA office in Khartoum, and US officials have noted Sudan’s role intercepting suspected terrorists along its border with Libya. In late 2017, finishing a process begun under President Barack Obama, the Trump administration lifted most of the economic and political sanctions in place against Sudan, citing its progress fighting terrorism and protecting human rights. It also removed Sudan from the travel ban. Meanwhile, for the European Union, Sudan has been an ideal place to staunch the flow of irregular migrants crossing the Sahara toward the Mediterranean. In 2014, leaders of European and African countries met to develop the “Khartoum process” for “preventing and fighting migrant smuggling and trafficking in human beings” in the corridors between Africa and Europe. Since then, the EU has spent millions on surveillance equipment and the training of Sudanese border guards – which critics of the Bashir regime note could also be used to monitor Sudanese citizens. The demands of Sudanese protesters, however, may eventually become difficult for the West to ignore. Since protests began in the eastern city of Atbara in mid-December over the rising cost of basic commodities, they have spiraled into a largely leaderless mass movement that is now calling for Bashir’s resignation. The demonstrations now include everyone from day laborers in the country’s impoverished peripheries and Darfuri activists to professors, activists, and opposition politicians in the capital. In some ways, observers note, the protestors have reason for optimism. Twice in Sudanese history – first in 1964 and then again in 1985 – mass movements have brought down a sitting Sudanese head of state. But there are crucial differences this time around. In previous eras, for instance, the government began to crack when low-level members of the army refused to violently put down protests. This time, more than 800 people have been arrested and more than three dozen people killed, and security forces, so far, show few signs of an about-face. Bashir, meanwhile, has a lot to lose if he is toppled. Wanted by the International Criminal Court for war crimes in Darfur, he could also face charges at home if a new regime takes over, given his three-decade track record of violently heavy-handed rule. “The stakes are too high for a smooth transition,” el-Gizouli says. At the same time, he notes, the protests show no signs of abating.